The best part of 2 years ago i inflamed the pudendal nerve bundle as a result of too many kilometers on an ill fitting saddle. The result was an awful burning sensation where a guy really does not want it. I parked the bike up and for the best part of a year and a half i did not ride as i was dealing with the nerve inflammation and burning sensation. “To anyone that has not experienced this issue it can’t be explained how awful you feel, how much discomfort you are in and how much it impacts your day to day life. The burning was always there 24 hours a day, 7 days per week……all because of a bike saddle. I cannot explain how important it is to have a saddle that does not put pressure in the perineal area and does not squash your pudendal nerve bundle. Genuinely, this is not something to be ignored nor something to be put up with. During this time off the bike i spent a lot of time investigating different bike saddles looking for the right one to make a return to cycling on. 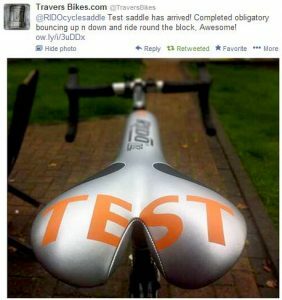 It was during this time reading I came across the Rido saddle. “I initially took a punt and picked up the original Rido saddle and while I really liked the way it felt, it simply looked ugly on my Kuota. It is now on a mountain bike that i ride about the streets with my kids and i still love the feel of it. I did like the original and I had no doubt my perineal area was taking no load, so, i went ahead and ordered myself the RLt. “Since then i have not looked back. I have been riding again for a few months and feeling real good about it. As part of my return to the bike i went off and got a bike fit that included “pressure mapping.” The pressure mapping focused on the contact points (pedals, handle bars and saddle) to show where my load was carried when i was on my bike. For me the “pressure mapping” was significant as i really needed to know that i was not loading up the wrong areas again when i started to get out and ride again. Attached please find a snap-shot/screen grab of my pressure mapping. Very clearly the screen grab shows that my weight is carried on the sit bones and no load was being carried in the perineal area. (The yellow on the right shows most load on the down stroke on that side. The colours changed from side to side as my pedalling motion shifted.) 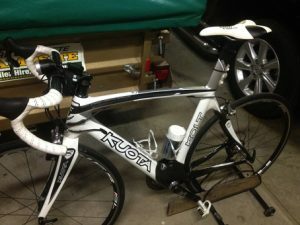 This bike fit was done with me having the RLt on my Kuota. 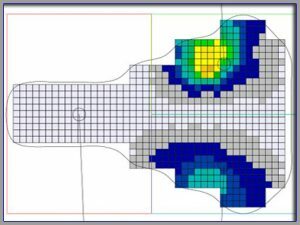 “The guys that did my pressure mapping bike fit are one of the big bike brands who have in recent years put a lot of effort into its saddle design and bike fit process. 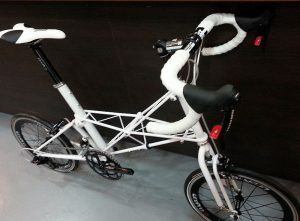 I was pleasantly surprised to hear that the bike fit guy was real impressed by the performance of the RLt and how it clearly made me carry my weight on my sit bones and little pressure carried elsewhere. He had never seen a RLt prior and was unaware of the Rido brand. I mentioned to the guy that i had a number of other bikes at home in the shed and asked what saddle of the big brand he would recommend for me to look at. The guy looked at me and said “I can’t recommend any of the (big bike brand) saddles and say that they are better than what you are already riding. If I was you I’d fit all my bikes out with the one you have already got”. This was a wonderful piece of feedback and i really could not have been happier to have the RLt on my Kuota. The mental comfort that i now have after the pressure mapping exercise can’t be put into words. “Initially the saddle did feel odd as it really focuses your body weight onto your site bones, but after a few rides i am very comfortable with it and would now not be without it. 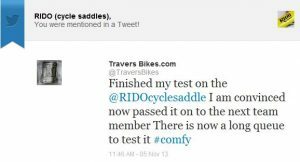 I am just so pleased i came across Rido and want to thank you guys for the wonderful work you have done in developing the Rido saddle. 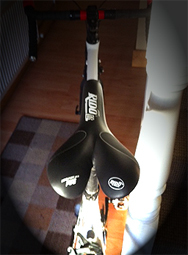 I have got quite a few comments on my saddle and i am very happy to recommend Rido to anyone who will listen. It feels great to ride and i have the proof to show that your saddle really does do what it claims. Thanks again, you have a great product and i could not be more happier to ride it. Thanks so much. “I got on ok with the R2 but some how never seemed to get it just right. The boys in Singapore have done a fantastic job with the UK Moultons and the White/Black Rido LT was their first choice saddle!